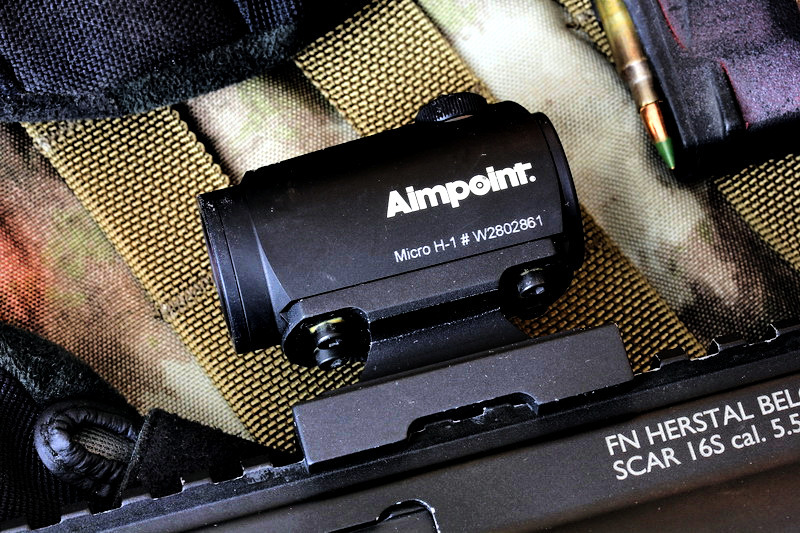 According to the Aimpoint website the H1 is designed for hunters in mind, but is an almost exact copy of the T1, I will get into the differences later. The H1 is high strength aluminum, anodized in a semi-matte finish. 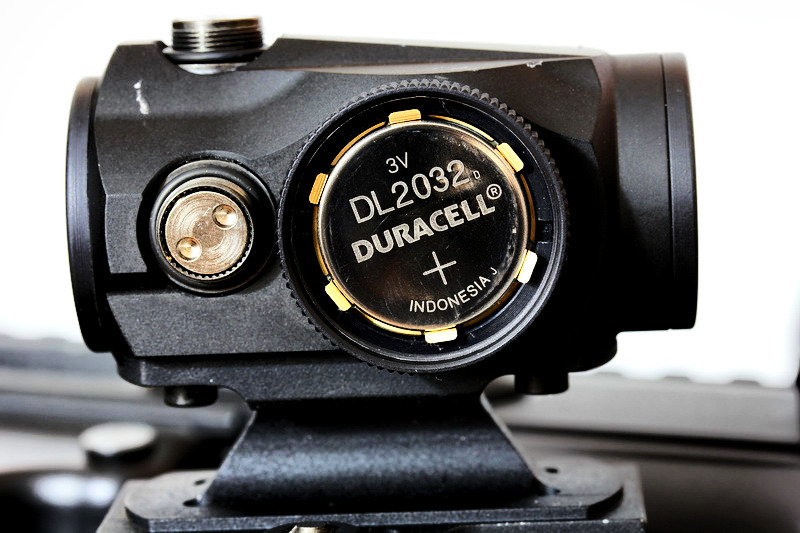 It uses ACET (Advanced Circuit Efficiency Technology), Reflex collimator sight - red dot sight. The H1 is an excellent alternative to the T1, which normally runs for around $100 or so more, as of today comparing Amazon prices (H1, T1). 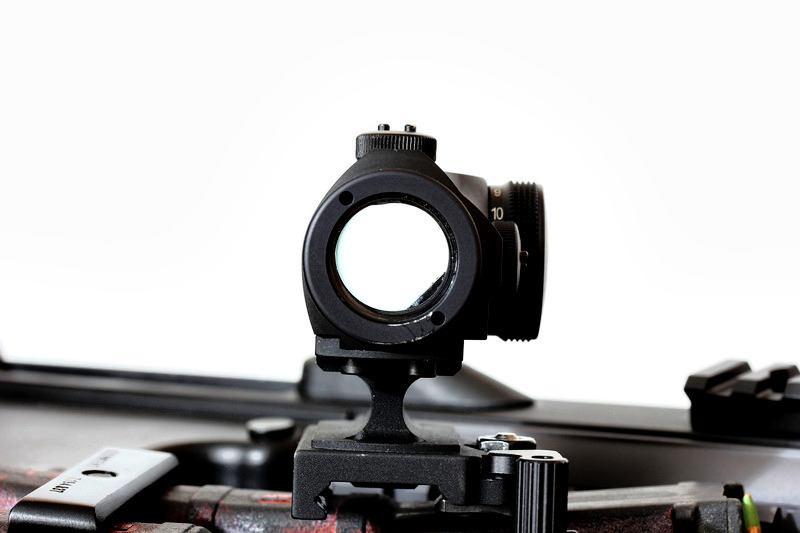 The H1 I have is the 4MOA model, but there is a 2MOA model for those who want a slightly more fine RDS dot, also does better when aided by a 3X magnifier. I opted for the 4MOA over the 2MOA because the 2MOA was not available for purchase when I bought the H1 on black friday from Palmettostatearmory.com for $449 (shipped). Which was a pretty good price at that time. 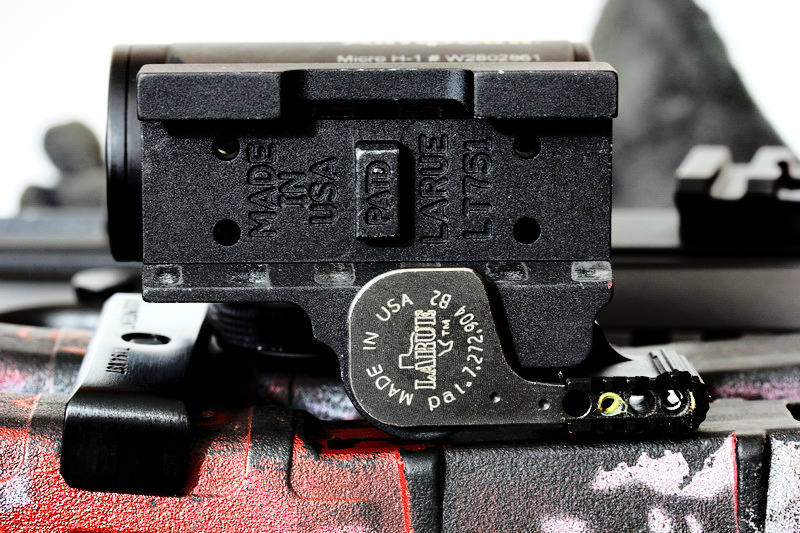 According to the LaRue website, the LT751 mount is precision-machined out of bar-stock aluminum and matt black anodized to provide a durable non-reflective surface finish. I purchased this mount for the specific reason of having an absolute co-witness with the H1 when using the OEM iron sights on the SCAR. 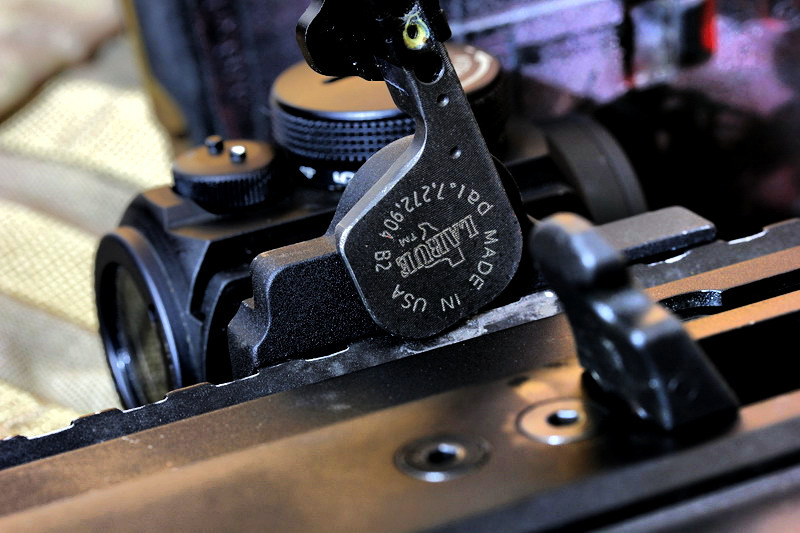 The mount is reversible, which is important for me on the SCAR and came with the QD speed lever option. I paid $88.20 for it (before shipping), this was before their prices went up. I was in the market for an optic that allowed me to engage from a bad breath distance to right around 200y without any bells or whistles. Originally I had ran the SCAR with OEM iron sights for about 2k rounds in various classes, shoots and drill, then decided that an optic is definitely on the menu to maximize my ability to operate the SCAR. I originally purchased a TA31F-G, which was an excellent optic but just did not do enough for me in terms of close up, speed shooting. I ended up supplementing it with a LaRue 724 offset mount for a H1/T1, I purchased a PrimaryArms Micro dot and ran it, strong side. It worked well, and I went through a few dozen matches with it never being able to really get the hang of it. Then I got the itch of having too much stuff on my rifle and needing to get rid of it for something that does both. Around this time the Burris MTAC was out and I decided to downgrade to it. I say downgrade because the optic was not more than $500, which the ACOG more than double in cost. I ran the MTAC for a class and hated it immediately (I can get into why if anyone wants to know, comment and I'll add info). I got rid of it after that class. Ended up buying the H1 from PSA, it came on an LRP mount. 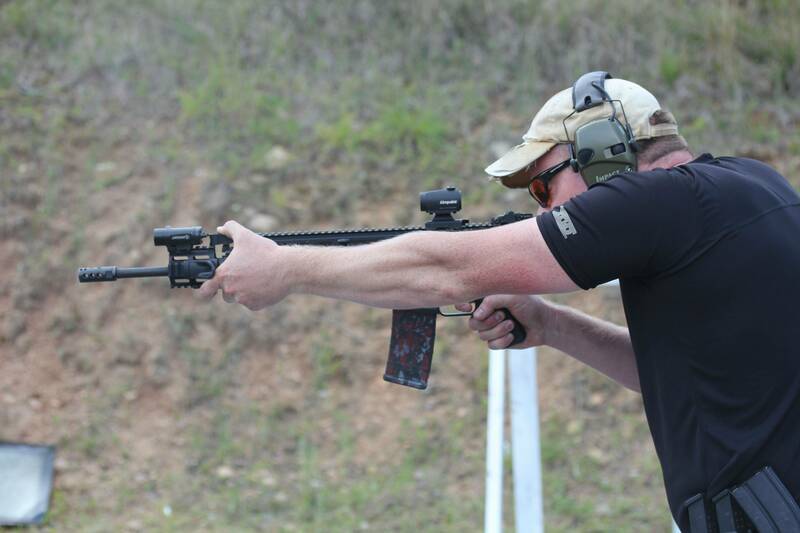 I put the optic on my gun and hit the range, doing a few drill sessions with it and a match or two, it worked really well. I started having issues with the LRP mount after about 3k rounds, the zero started to shift. I did not know why and I was not going to mess with it. I went with what I knew to work, which was the LaRue mount. I required an absolute co-witness because I wanted things to be simple. Same 100m zero (thanks to F2S awesome zero suggestion) on the optic and the iron sights so when I have to go irons only I get the result I want without having to do much math. 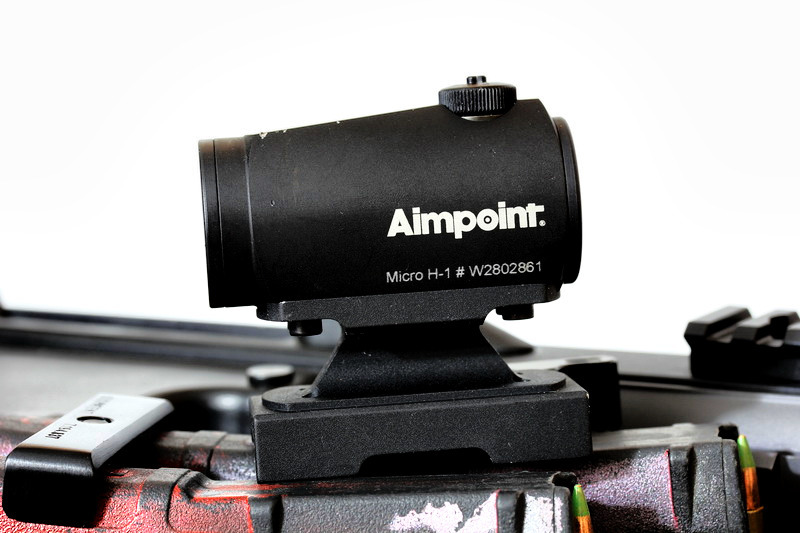 I bought the mount, zeroed it at 100m and had great success in the following classes, matches and drills. When I first received the H1, it came in a white box with a small instruction manual, a red "key" to adjust the click, the cover for the battery (it uses a CR2032 battery, pictures below) and adjustment caps (also pictured below). 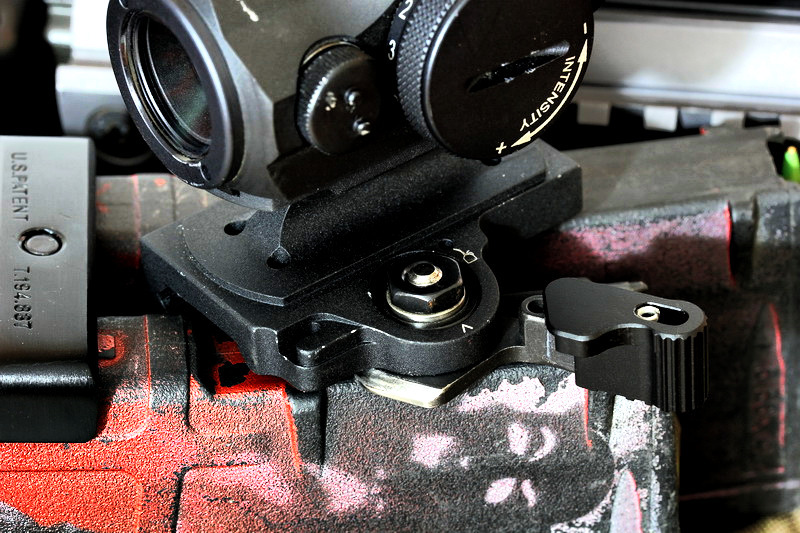 I used the OEM screws with some of the loctite that was provide with the LaRue mount to install the optic on the mount. I was very pleased with how the optic was mounted and the overall design. I opted to mount the optic on the mount so that the QD lever was on the right side because in conjunction with the TangoDown angled charging handle it just flows very easily. 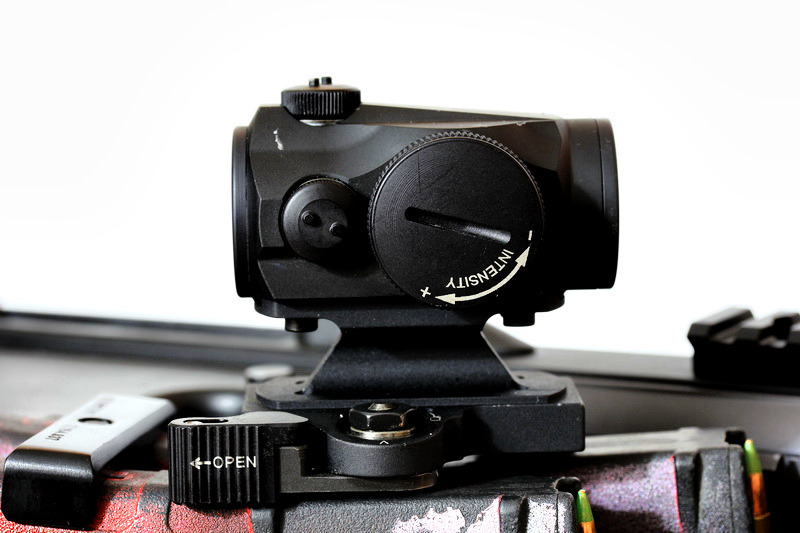 I also like how the QD system works, I can remove the optic from the rifle and place back in the same spot without issue or worry of zero loss. 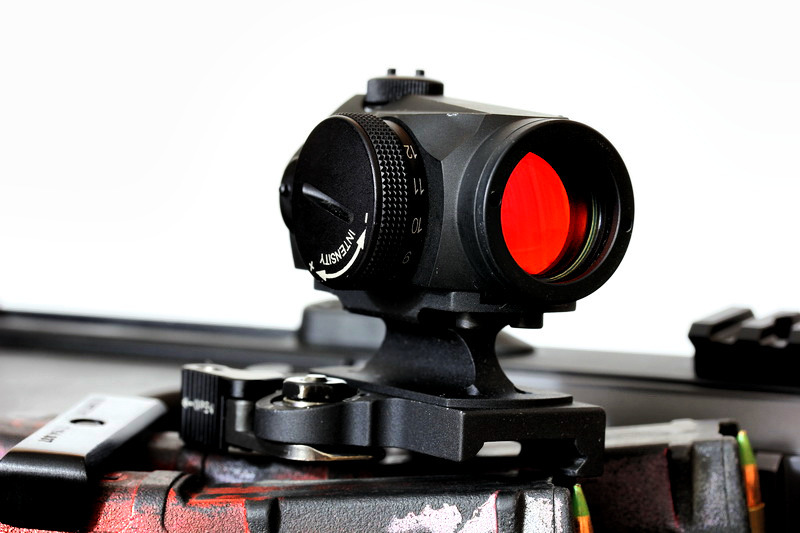 The LaRue QD mount is very sturdy and does the job very well. 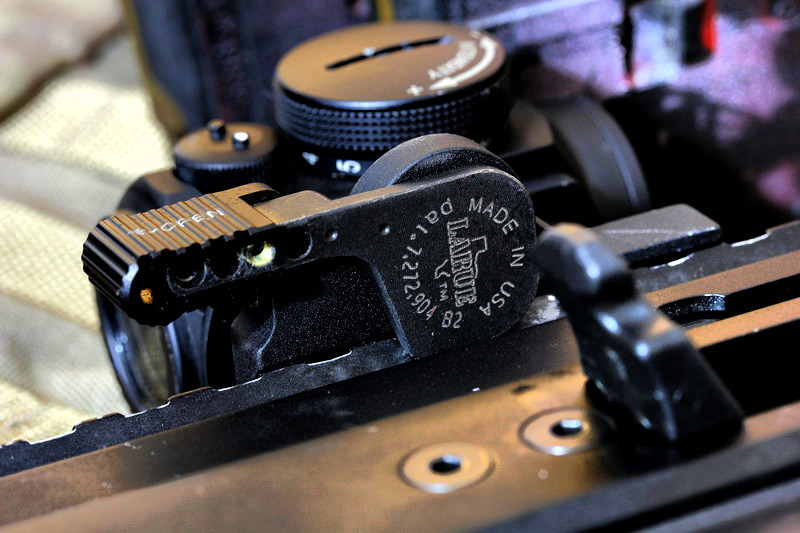 I have no complaints of it and chose it because I had a LaRue mount on my ACOG and the Burris MTAC. I have put roughly between 5k-8k (rough estimate) rounds through the SCAR with this optic on it, about 3k with the LaRue mount on the optic. In that time I have had zero shift one time, which I attribute to taking the optic off and forgetting which T-row I had it on, but once I marked it, re-zeroed and moved on I had no further issues. The optic is rugged in its design and while I am not going to hit it with a hammer I am sure it would be able to handle it. I am pretty happy with the battery life. 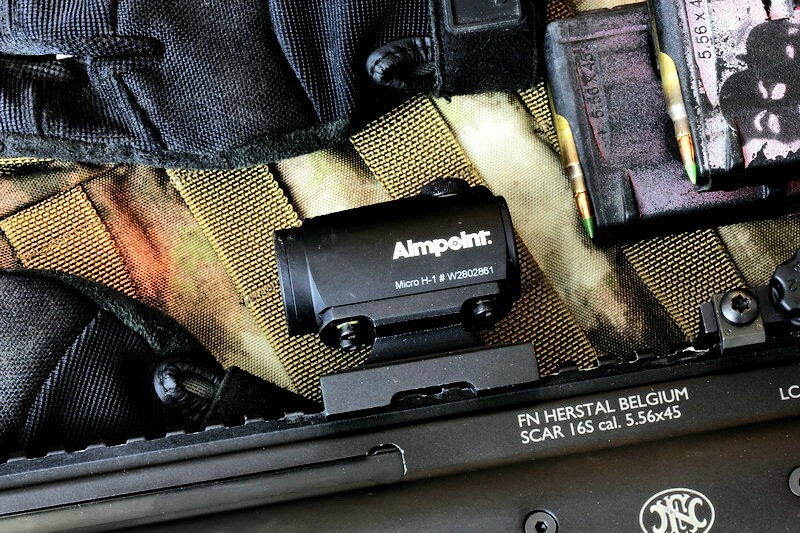 Aimpoint boasts 50,000 hour battery life, I do not know how long I have had it on, but I turn it off when I am not using it. The H1 is able to be adjusted at 1/2" at 100y. Which makes for pretty easy adjustment to get proper zero. 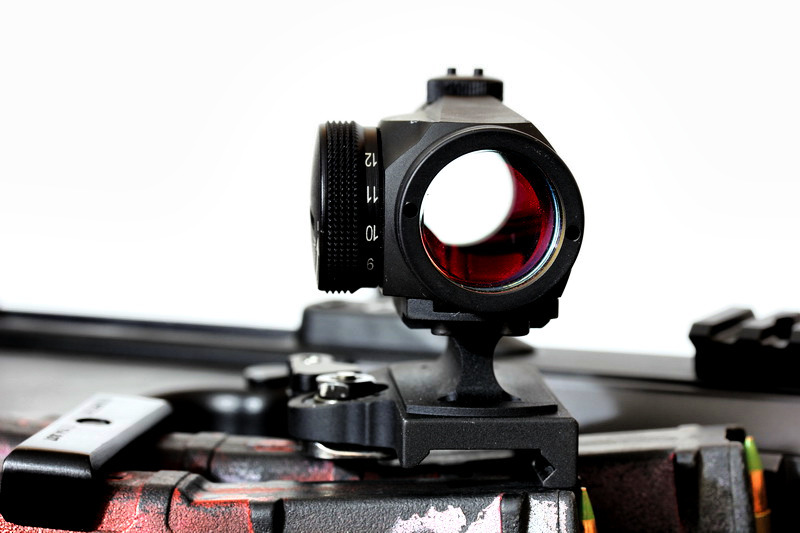 The greatest improvement when using this sight as opposed to the others I have used is that it is much faster to acquire. 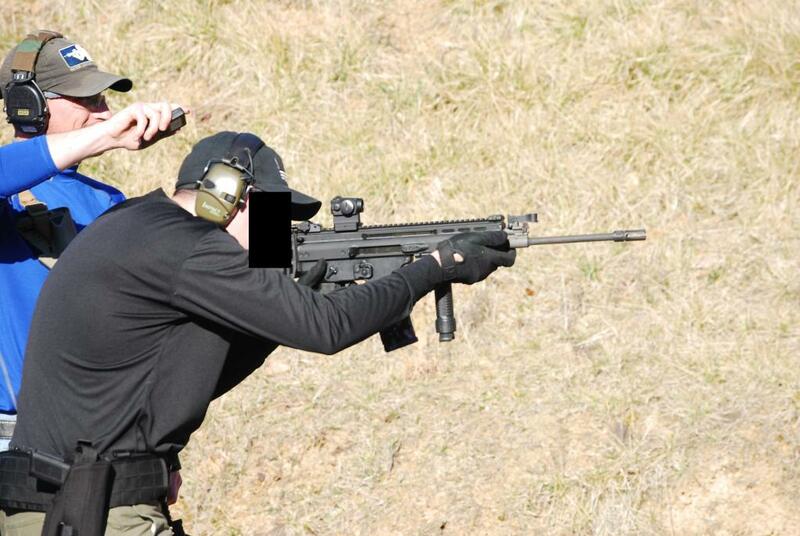 I had run a few drills for time and the H1 performed very well and I really have no complaints. The optic has some scuffs on it, but that is to be expected since I do not baby my gear. I have been able to hit from bad breath to 300m without much issue using 62gr wolf/tula/russian steel ammo. The optic needs nothing for that range. I had gone out to 600y with 62gr ammo and it was not something I want to do on a regular basis. I may add a 3x magnifier to supplement the H1 and be able to do some distance work, but for what I have the H1 for it is not required. 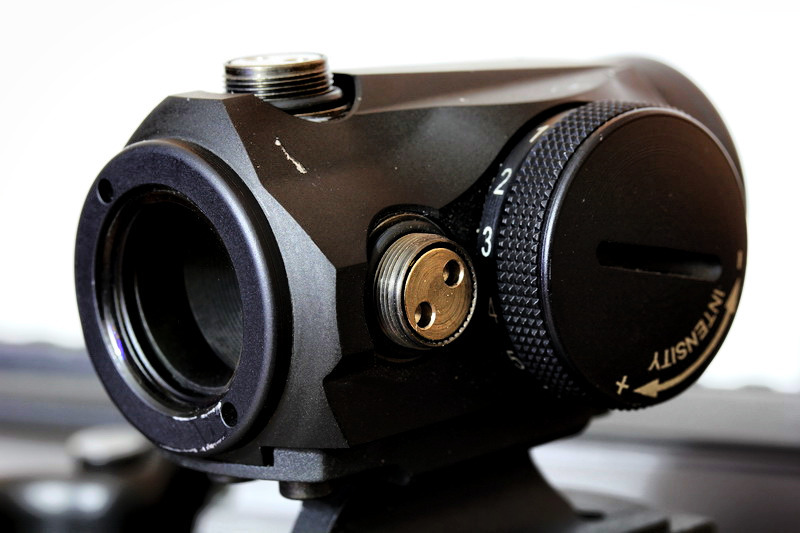 The optic continues to be very adjustable and flexible. I am able to use it with either eye and in various positions. The benefit of having absolute co-witness works well for me and I am happy with the result of the addition of the LaRue mount. The only reason to buy the T1 over the H1 is that it is specifically designed for NV use, adds a better waterproof construction and has greater temperature tolerances. If I was running some type of NV setup then I would probably be able to justify the added cost of the T1, then again I would probably be running some type of DBAL, so I doubt price of an optic would really be something to concern myself about. 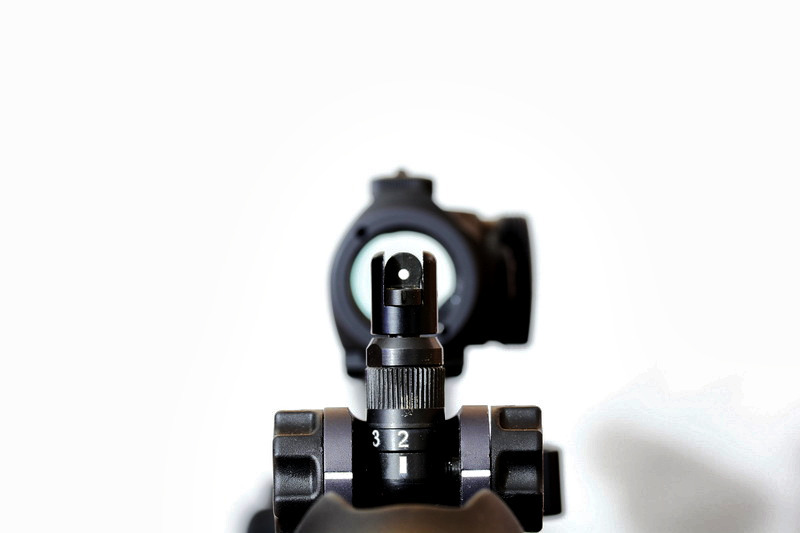 For what this optic is, a pure and simple RDS with no real thrills, bells or whistles it really does an excellent job. 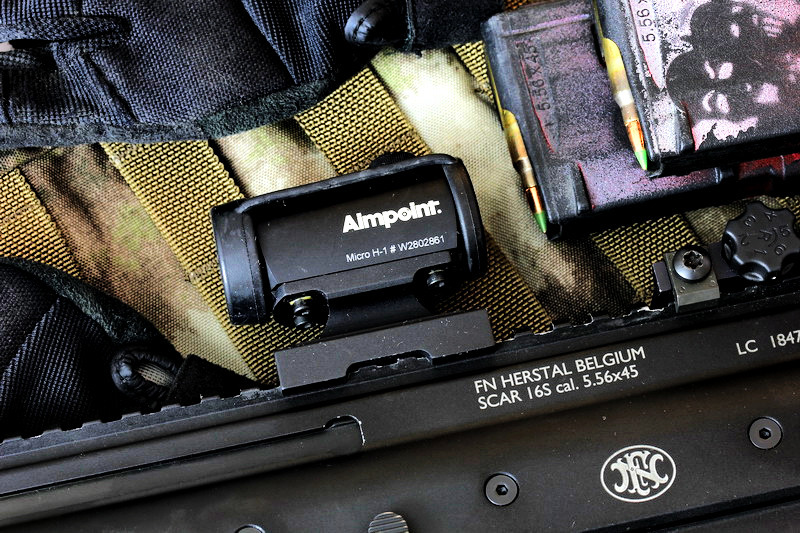 I would suggest looking at the Aimpoint PRO for a cheaper alternative, specifically because Aimpoint is an awesome company and the PRO apparently has the same long battery life and has 2MOA. It is bigger but not by much. I may end up buying a PRO for my SR15 and adding a 3X down the line. If you want other options, the PrimaryArms which I listed above is a good VERY CHEAP alternative. I have one that I beat the crap out of on a beater rifle and it sort of works, I will review it eventually. You can also go for an Eotech, though not my cup of tea still pretty good (aside from that battery life issue they seem to have). I will continue to use the H1 until it either breaks or I find something which is way better, but I doubt that is going to happen any time soon. 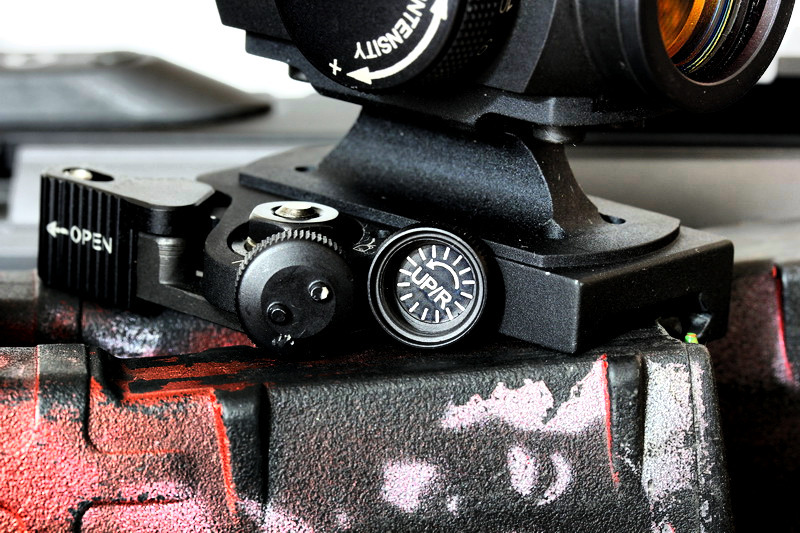 As for the LaRue mount, I will also continue to purchase LaRue mounts since I have had very little, if any, issues with their mounts. The price is not the cheapest but you ultimately get what you pay for. Also there is a cover coming out for the H1/T1 soon, the IO Cover. I have three on order so when they get here I will snap some shots and post.